Collaboration with Michael Ries, Joel Bobeck and Yeohyun Ahn. Publications : Washington Post March 17th, 2007 "Me, My Cell and I: Can You Hear Me Now?" The mobile phone occupies a space that is both connecting and distancing. Seemingly ubiquitous, it has become an increasingly powerful tool, functioning as a phone, PDA, browser, and camera. “Mood,” is a combined Internet and spatial installation that displays the collective emotional condition of users as color hues. It is based on the wearable “mood ring” which chemically changes color according to body temperature. The users participate by answering a survey on their cell phone specifically designed to gauge a person’s emotional level. This information is then collected, parsed, and averaged. The results are visually projected on the wall. 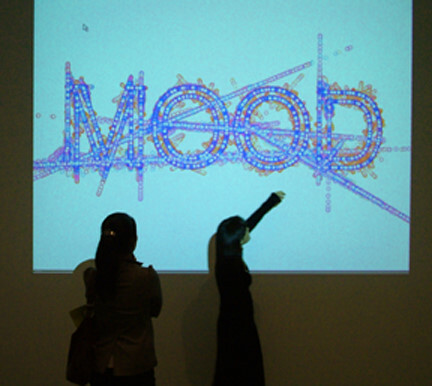 The colors of the projection are matched to different emotional states. The collective answers are averaged, and add to the projection's overall appearance. By allowing people to share this intimate data, the piece creates a radically new social dimension, giving individuals not only a new way of looking at their own emotional state, but also the current emotional state of their environment."